Travel to the black, volcanic sand beach of Amed and head out into the Bali Sea for two open water dives. After arriving at the beach, you'll board a traditional Outrigger boat for travel towards the dive site. Here, you can expect to see some of the most stunning underwater topography in Bali, including vertical walls and pyramids. You'll also explore the wreck of a Japanese boat, adorned with beautifully coloured corals. Depending on your prior certification level, you can dive to a maximum depth of 100 feet. A certified dive instructor will accompany you throughout the two dives. NOTE: A minimum of 2 travellers are required to book this trip. All prices in this package are subject to fluctuations based on international currency exchange rates at the time of booking. Amed beach, a little known beach in northern Bali, is close to a few dive sites that feature interesting topography. Apart from unique rock formations of vertical walls and pyramids, the dive site comes with a deep drop off in the sea floor. The wreck of a Japanese boat adorns the sea floor as well. The soft and hard corals near the wreck are home to a range of marine life including triggerfish, grouper, scorpionfish, bumpheads and moray eels. With little to no ocean current, the dive sites of Amed are perfect for divers without any drift diving experience. 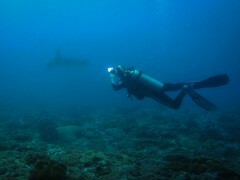 Visibility at the dive site often extends beyond 80 feet. • Go scuba diving in Bali at the fascinating dive sites of Amed. • Explore the wreck of a Japanese boat. Go scuba diving in Amed! Report at the dive center in Padang Bai by early morning. You'll meet your dive instructor and travel to the Amed beach in a car. From the beach, you'll ride in a traditional outrigger boat to reach the dive sites near Amed. En route, you can enjoy views of the beautiful, blue Bali Sea as far as the eye can see. Over the course of the day, you'll complete two open water dives and explore gorgeous corals teeming with exotic marine life. You'll be accompanied by a certified dive instructor during the dives. Lunch will be served on the boat between the two dives. The boat will return back to the beach, and you'll travel back to the dive center by late afternoon. Your trip ends here. Spot schools of hundreds of brightly coloured small fishes.